When it comes to Nautilus R614 recumbent exercise bike, it is not only the convenience but also the inspiration that the bike offers you. Together, they will help you to commit to exercise and achieve your fitness goals. There’s a lot that goes into making a perfect exercise bike. The design must be aimed at maximizing comfort and providing excellent exercise experience. The perfect bike also should not be too expensive but need to be equipped with the most advanced features that can make your workout progress more effective and smarter. Nautilus R614 has all of those. I’ll explain why in this review. Since being founded in 1970, Nautilus has revolutionized the fitness industry. It is the gold standard in fitness and widely considered the founder of the modern commercial gym. Nautilus has a wide range of circuit training equipment. Nautilus commits to carry on its tradition of excellence by producing gym-quality cardio and strength solutions for the home. They produce upright bikes, treadmills, recumbent bikes and ellipticals for home. With all of the efforts and experiences, Nautilus exercise bikes inspire you to achieve your personal best. “Training at home doesn’t mean training alone”. Nautilus helps users connect to a virtual personal fitness coach and training buddies. The apps allow you monitor your personal data and workout stats to schedule a most effective workout plan. 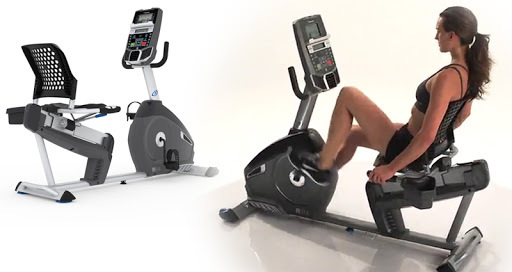 Nautilus R614 is a recumbent bike, which is the bike for maximizing comfort, blood flow, cardiovascular and lower body workout. The recumbent bike is like a chair with pedals in front of the seat. This design makes it easy on your back and knees, making sure that you will feel enjoyable and won’t have any injury while practising. 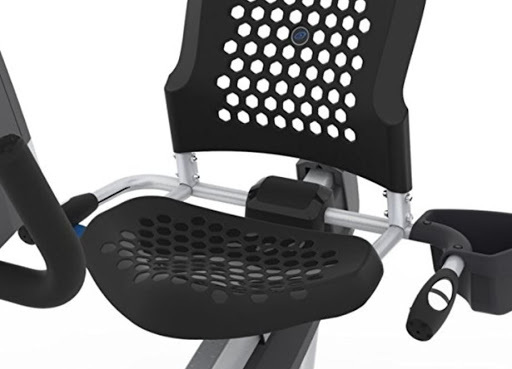 Focusing on the comfort and the easiness for the user makes Nautilus R614 the best choice for those want to maintain a healthy lifestyle or being in a physical rehabilitation and physical therapy. It is designed for those have problems with joints or being injured, especially for kids, women and oldsters. This a middle-class recumbent bike, generally, it is way better than budget bikes (i.e. 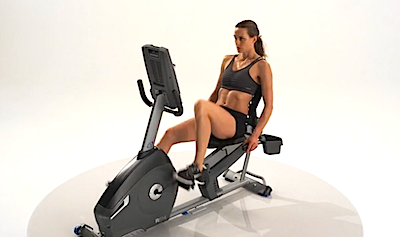 Exerpeutic 900XL [Link: article 4], Progear 555LXT [Link: article 5]), but is not as good as high-class recumbent bikes (i.e. Schwinn 270 [Link: article 3]). Overall, Nautilus R614 is really a wonderful bike, thus, I will be more critical in this review. The appearance of Nautilus R614 looks nice in three colours, black, white and dark gray. This combination of colors is harmony and easy on the eyes. Its design is modern and ergonomic, which can be a good decoration for whenever you put it. Nautilus R614 supports users up to 300 lbs and 6 feet 3. In fact, a 400-pound man has no problem pedalling on this bike. Nautilus R614 can be assembled. You can disassemble and store it easily when you don’t want to use it for a long time. Its frame, seat, handlebar, pedals are all well ergonomically designed, providing maximum support to your arms, knees, shoulders and back. The bike has an intuitive console with many advanced functions and programs. The console, along with other additional amenities like bottle holder, fans, tablet holder, built-in speakers, gives you a maximizing convenience. The size of Nautilus R614 is not so compact, and the weight is not lightweight, too. Is dimensions are 64L x 27W x 50H inches(162.6 x 68.6 x 127 cm), and its weight is 80 lbs (36.3 kg). This makes the bike hard to assemble and disassemble, which cause some problems if you want to store it. Furthermore, it is delivered disassembly in a 98-pound box. You have to assemble it by yourself, which could take up from 1 to 2 hours. I am sure that you will need someone for help. The pedals need not be larger for more comfort. And the plastic straps of the pedals might hurt you. The plastic seat bottom is ergonomically designed for comfortable sitting feeling, however, since it’s not padded, it may be not soft enough. Nautilus R614 needs to be plugged in for power. The console and the resistance won’t work if there is no power. Nautilus R614 has a one-piece steel frame. However, some parts are made of heavy-duty PVC material, such as the protective shrouds of the bike’s drive mechanism. This gives the bike the solidity and the firmness while pedalling. It also features a low frame profile and step-thru design, making it easier for users to get on and off the bike. Two integrated levellers for a solid workout platform and oversized crossbar tubing for added stability. These stabilizers provide steadiness, combining with its low center of gravity keep the bike stable during workouts. It doesn’t shake or squeak, even when you are exercising really hard, allowing you to get on with an undisturbed workout. You can place firmly this bike on a floor that has some variation in it by turning these two rear levellers and a small leveller in the middle of the frame rail to level out the bike. The bike body is powder coated with corrosion resistant paint, which makes the bike look good in black, white and dark gray. Nautilus R614 is equipped with a vented ergonomic wide seat bottom with contoured leg area that offers you not only comfort and support of a smart design but also freshening of a vented seat. Nautilus R614 also has a large vented seat back with lumbar support for comfort and cooling. Its ergonomic design can really give you a relaxing sitting posture. Many find the seat and the backrest all comfortable despite they not being padded and just being plastic. However, some are more hard on them and feel they are not comfortable as padded seats. It is ergonomically designed for a relaxing position and an integrated hand-grip for heart rate monitoring. 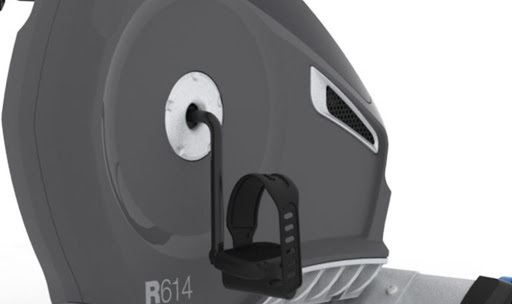 Nautilus R614 does not have one essential feature that is a handlebar slider mechanism to contribute to an ideal user interface position. Some superior bike has this feature, such as Schwinn 230 [Link: article 2] and Schwinn 270 [Link: article 3]. 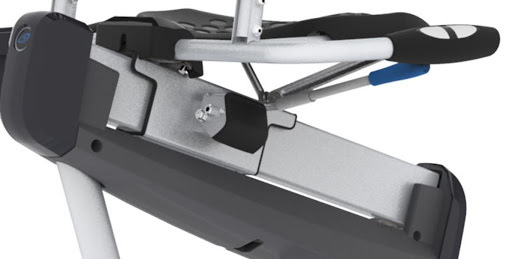 Nautilus R614 pedals are designed with adjustable foot straps in order to provide proper alignment for efficient pedalling with ultimate control. They also enhance the comfort of user’s foot, ensuring the practising experience is smooth and rhythmic. However, the pedals are not oversized, and the material of the straps is plastic, which may be considered as a minus point. They equipped Nautilus R614 with such an advanced computer. The console table has two display with touch control buttons to provide important information about your workout and lets you control the resistance levels while you exercise. Program Display: Show the current program, which can be the manual program or a profile program. Intensity Display: show the level of work at that moment based on the current resistance level. Goal Display: show the currently selected type of goal (Distance, Time or Calories), the current value to achieve the goal, and the percent completed toward the goal. User Display: Show which user profile is currently selected. Achievement Display: when you reach a higher workout target in comparison to the past, Achievement Display will activate to congratulate and inform you. Speed: Show the current speed (mph or km/h). Time: Show the total time of the current workout, the average time for the current user profile or the total exercise time of the bike. Distance: Show the total distance of the current workout. Level: Show the current resistance level. RPM: Show the current revolutions per minute. Heart Rate (Pulse): show the beats per minute (BPM) from the heart rate sensor. Calories: show the estimated calories that you have burned during the current workout. – USB port: An additional USB port for you to export your Workout Results to a USB drive, and upload it to some fitness apps. The default app is Nautilus Connect. – Speakers: Built-in speakers let you enjoy music while exercising, making the workout more interesting. – Three Fans: Keep you cool during the intense workouts. – A Water Bottle Holder: A water bottle holder, positioned on the handlebar, is close at hand for easy access while working out. Drinking right amount of water every day is an essential habit to maintain your healthy lifestyle. Only one minus is that the seat bottom is not padded, which might make some feel uncomfortable in long hours workout. 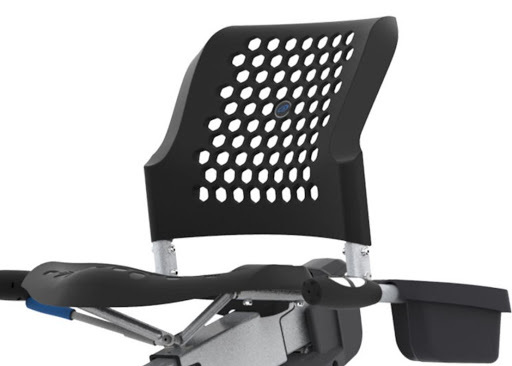 The Nautilus R614 ergonomic design on the seat, the handlebar, the shape give the user maximized comfort when sitting. Leaning your back on the seat back, holding the handlebar to lift your body up, the lumbar support and ergonomic handlebar will help you sit comfortably, maintaining good posture that is really good for your spine and shoulders, as well as keep you full of energy. As said above, only one minus is that the plastic bottom may make some feel uncomfortable in long hours workout. Magnetic resistance mechanism offers you a smooth pedalling experience. Come along with stable feeling, without any shaking due to the rock-solid design, no matter how heavy you are and how fast you ride. Furthermore, 20 levels of resistance are available to fit your need. The pedalling experience will be even more rhythmic thanks to the USB port and the built-in speakers. As many know that music can really benefit your workout. Music can not only boost your mood, push your performance, help you keep pace but also can be used for recovery. The beat is like a signal to your brain that keeps you maintaining a rhythm. You might pedal for hours without notice that. When practicing hard, of course, you will sweat and feel hot. But, the holes in the seat and the three fans in the console produce air circulation. And you won’t feel uncomfortable and exhausted by muggy air. The console table, which makes this bike so worthy, is really good. Here are some modes and programs you should give a try. – Fitness Test Program: This test measures how your physical fitness level is improving by comparing your power output to your heart rate. The higher the power output is, the healthier you are. – Heart rate control Workout programs: This mode lets you set your target heart rate for the workout. – Goal track statistics: The statistics from every workout are recorded to a User Profile. – BMI Measurement: Input your height and weight, the console will simply do a division to give you your BMI score. This bike uses electric power for the console and resistance system. Plug it into any standard electrical wall outlet on a 110V-120V circuit. One 90-240V, 50-60Hz adapter included AC power adapter is included in the package. This might seem as a disadvantage since the bike won’t work without electric, thus, you need to place the bike nearby an AC outlet. Nautilus R614 costs more than $300. A really good price for such a great bike like this bike. Nautilus R614 comes with an excellent warranty program: 10 years for frame, 2 years for mechanical, 1 year for electrical and 90 days for labour. That’s the warranty plan of the manufacturer, you can also buy added protection plan from the retailer if you want. However, I think the manufacturer plan is enough. Nautilus R614 has a high Amazon product’s star ratings. This index uses an AI model instead of a raw data average to give customers better information. In particular, it considers the factors like the age of a review, helpfulness votes by customers and whether the reviews are from verified purchases, to calculate the final score. So, basically, this product is high-rated by users. 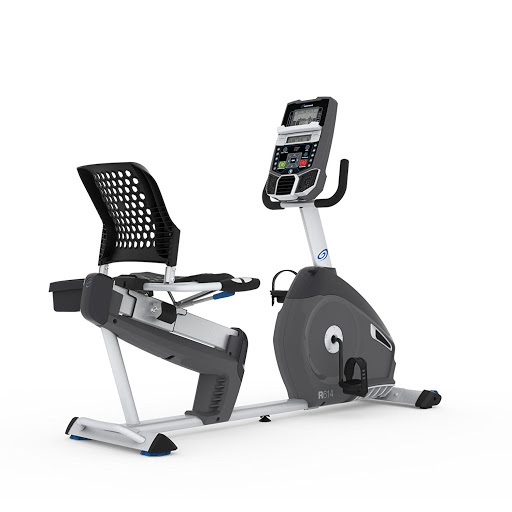 With all of the advantages, Nautilus R614 is a great exercise bike at this price. In the comment section, there are many positive reviews. They said that they had no problem assembling the bike and the riding feeling was great. They said that the bike was great as the fitness center bikes, which makes them totally impressed. They confirmed that they can roll the bike easily to different places if necessary, the seat was comfortable even tho not padded, the operation was really quiet, the console and its functions were really interesting. They also enjoyed the rack which to place book or iPad while exercising, together with the built-in speakers, making the pedalling really fun. And they like the fitness apps too. Some even said that they have injured knee and have used the bike easily. Also, there are some negative reviews, mostly because of the quality control process – these problems are easy to fix as that they offer replacements for defective products. Some complaint about the belt, the bearing have been broken after a year of using, however, this is quite easy to fix because these components are easy to find on the market. Some didn’t like that way that the backrest is not adjustable, making them not able to lean back while they are reading or watching television, thus it puts a strain on your neck and upper back. To solve this problem you can put a pillow on the seat bottom. This bike is a advanced equipment that surely can motivate you to maintain a healthy lifestyle. 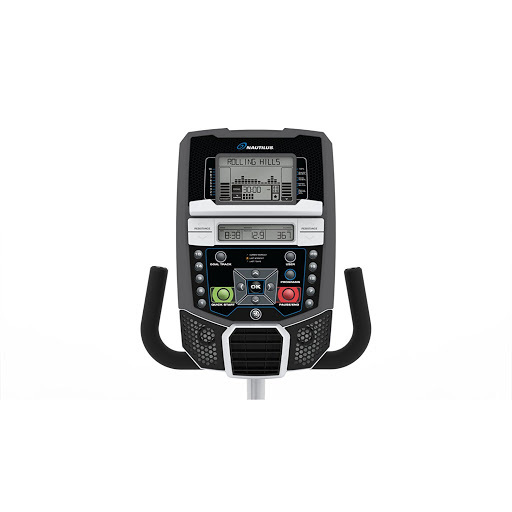 Nautilus R614 is not too expensive but has the most advanced features that can make your workout progress more effective and smarter. Its interesting features are designed for improving cardiovascular health, physical rehabilitation/physical therapy treatment, and fitness. Nautilus R614 is a great choice for those have injured joints and spine, children, women and oldsters.